Raith Rovers slipped even further behind trailblazers Arbroath on Saturday, and boss John McGlynn is under no illusion why. While the Red Lichties, now champions in waiting, were winning at home against East Fife, Raith were losing at Station Park to Forfar. 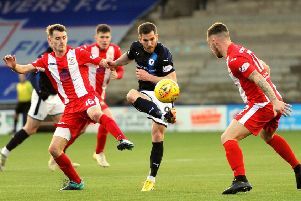 The points dropped away from Stark’s Park has frustrated McGlynn this term and have been a massive factor in the club’s failure to challenge at the top of the table. The gaffer, whose side will host on-form Dumbarton this weekend, said: “Our home record is up there with any team. “But you look at the stats; we’ve lost seven games, six have been away; we’ve drawn nine and seven of them have been away. “That’s where the damage has been done. “There’s 39 points we’ve dropped this season, and the vast majority have been away from home. With the race to finish inside the top four heating up, Raith are locked in a battle for the second, third and fourth positions with Forfar and East Fife. McGlynn took his side to Station Park on Saturday, but they couldn’t kick clear daylight between themselves and the Loons. A 2-1 win for Jim Weir’s men saw them leapfrog Raith into second. “When you wake up on Saturday morning and you’re one point ahead of the opposition, it’s not rocket science to work out that if it’s a draw you go further ahead, or you’re going to be four points clear or two behind,” said the Raith boss. “So, you have to deal with that. You have recognise that one of these things are going to happen. I felt we could have been ahead at half time with the number of chances that we had, though I appreciate Forfar also had opportunities. “I thought we put a lot into the game. We started well; there was nothing in the game. “We were attacking and they got a break forward into midfield - a good, diagonal ball out, a cross into box - and we are not marking in the central area of the goal. “You have got to pick up in there. And they go ahead. “We took over after that - I am counting eight attempts at goal and we haven’t really hit the target. “Kevin Nisbet probably came the closest by hitting the post. “So I count eight, and possibly two or three for them - and one gave them a goal. That is the vital one - of course it is. But it’s not like we didn’t put a lot into the game or create chances. “We started the second half very well and scored a really good goal, so I was expecting us top kick on and go and win the game from that position. “From our point of view we then lost a very soft goal. We had possession of the ball then we get caught out with a quick throw in down the line, and we don’t defend well enough after that. “We have possession right in front of the dugouts. Crane plays to Bajonas, he loses possession, loses a throw-in. They throw it, they go up the line, deliver the ball across the face of the goal and we are 2-1 down. “For us it is repetition. If I could put it right, then I would do. It’s going to take the summer to sort it out”. 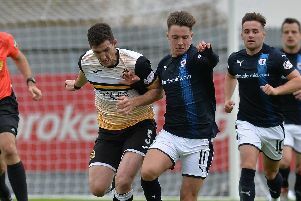 This weekend Jim Duffy brings his ever improving Sons to Stark’s Park - and McGlynn knows his side will have to be at its best to take all three points and potentially reclaim their grip on second. “There are seven games to go and we’ve both got difficult games to play,” he said. “If you finish second the advantage is that the second leg of the play-off game is at home. “So that’s what we want to do and finishing second would also mean that we’ve had a good end to the season, which is what we’ve been saying for many weeks now. “But the league is such that there’s nothing in it. Anyone can beat anyone in this league so I think there will be a few twists and turns yet in deciding who finishes second. It’s the third meeting between Rovers and Dumbarton this season, with the Kirkcaldy side having the edge. In December they won by four goals to two, though just last month the sides shared the point in a 2-2 draw at the Dumbarton Stadium. McGlynn added: “At the moment Dumbarton and Forfar are probably the two in-form teams in this league. “Dumbarton were obviously the bookies’ favourites at the start of the season but had a lot of injury issues.